Free Diagnostic is included with all repairs. We'll perform a complete diagnostic to verify the problem and report results before undertaking any repairs. 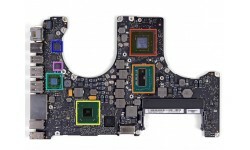 We specialize in component level repair on all electronics especially on Mac logic boards. Our engineers use the latest tools and high quality components to yield a high success rate of repair. All repairs carry a 6months quarranty. Logic board repair fixs problems such as no video, no post, scramble video, shutdown, port issues, kernel panic, freeze or intermittent issues, no power or no charging and repair of minor liquid spill damage. In case of severe liquid damage or physical abuse, your repair may cost more. We will contact you before proceeding with any additional repairs, including but not limited to complete replacement of your main logic board. Turn around time is 1-3days. However some intermittent Issues may take longer to replicate the problem. No charge if repair attempt is unfixable.